I want to end 2015 by writing about something that connects death and life. On August 12th I went with my husband and our friends, Anne and Huw to the large village of Bellaghy in County Derry, Northern Ireland. I’d been there before to visit Bellaghy Bawn, a substantial house dating from the early seventeenth century, from the days of the Plantation of Ulster. 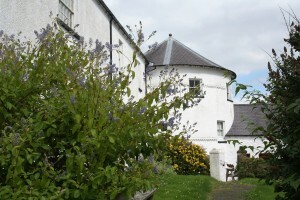 It has for some time housed memorabilia connected with the poet, Seamus Heaney who grew up not far away. But it’s not so much the Bawn that has stayed with me from this visit. It’s the graveyard. 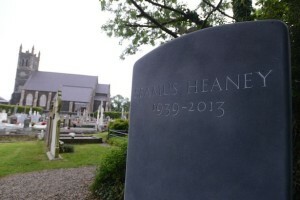 Seamus Heaney is buried in the graveyard of St Mary’s Roman Catholic church, Bellaghy. This is an old parish, dating back to 1814, though the present church is an imposing 1877 building. It’s a venerable graveyard, testimony to a long-established community whose graves, neatly side-by-side, take up every inch of space. It is extremely well-cared-for, to a degree that can only come from genuine dedication. These people don’t forget their dead. It’s a line from the poem, ‘The Gravel Walks’. That’s bold advice to give from the grave: a bidding us attempt the impossible (or indeed the inadvisable), lightly. But more impressive to me than even this arresting imperative or the simple dignity of the plot was a tiny detail of the grave. Near a corner of the kerb opposite the headstone two small stones had been placed. Pebbles. One white. One orange. They’re so small they barely register in this photograph but to me they were significant. I may be completely wrong but they seemed to me to be an instinctive tribute – placed there at a respectful distance but definitely placed, not random – a wanting to contribute something to this man who had given so much to so many. What can be given to the dead? Remembrance. Prayers, certainly in the Catholic tradition. Perhaps a pledge to take that heady advice and see what happens? To have this expressed so clearly endorses my own experience and makes it feel less strange but I’m comforted also by the fact that he goes on to acknowledge that, having internalised these attitudes, he grew ‘a skin to protect myself against them’. These are not comfortable attitudes. Having to grow a skin to protect against something that is already inside one could hardly be easy. 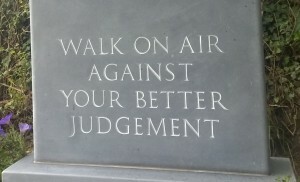 ‘because of a line I wrote fairly recently instructing myself (and whoever else might be listening) to ‘walk on air against your better judgement’. Poetry can create something at once true to external reality and sensitive to the inner reality of each person. I believe that this is true for every art. A Seamus Heaney Interpretive Centre is being built in the village which will probably supplant Bellaghy Bawn’s role as Heaney ‘treasury’. On the day we visited the Bawn it wasn’t due to be open but a member of staff kindly agreed that as he had to open it anyway for some maintenance work, sure we might as well come on in too. I hope that human touch, that pragmatic generosity (doing for someone what you’d want them to do for you) is not lost. There is an art to living too. St Mary’s, Bellaghy has two graveyards. The newer one is on the other side of the road. There are notable graves there too, of physical force Republicans of more than one type. 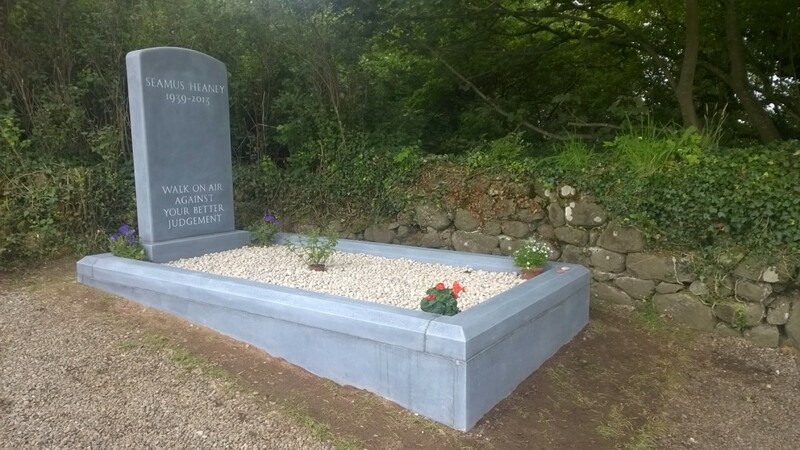 And in August the gravestone of another well-known Ulsterman was erected, that of Ian Paisley in County Down. Of these graves, Seamus Heaney’s is the most gravity-defying. ‘The Gravel Walks’ can be found in the collection ‘The Spirit Level’, Faber and Faber 2001. Various renditions of the tune ‘The Gravel Walks’ can be found on youtube but stay off those that are mainly vehicles for musicians who want to boast how fast they can play. This one is a nicely cross-cultural version with a bit of Scots to it. This is a very simple version on penny whistle.